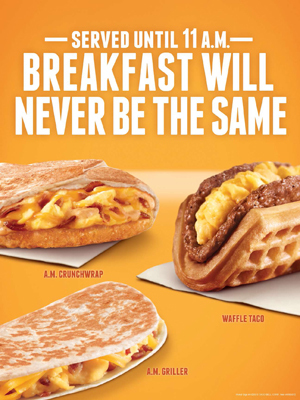 As I’m sure most of you are aware, Taco Bell has recently introduced a breakfast menu, available from about 7:00 AM until 11:00 AM at most of their restaurants. You might be thinking “oh, that actually sounds cool. I wonder if they’ll adapt actual Mexican or Latin American breakfast dishes into something that can be easily reproduced in a fast food setting?” You’re right, dear reader, that would be cool. It’s also almost the opposite of what they did. Rather than adapting Mexican breakfast food into a fast food context, they adapted standard fast food breakfast fare into vaguely Mexican shapes and formats. This isn’t a super new idea, as evidenced by even McDonald’s having breakfast burritos, and the majority of their menu is pretty standard breakfast burritos and tacos. The signature ones, though, are the AM Crunchwrap, a variation of their standard Crunchwrap full of breakfast meats and cheese and an entire hash brown, and the Waffle Taco, which is you guessed it, a waffle folded over like a taco, full of eggs, sausage and cheese. It also comes with syrup to drizzle across it. If it sounds like I’m angry about this, I’m not. This is basically the kind of thing Sandwichtalk lives for, and my only regret is that it took me so long to try it and report back. A lot of it had to do with putting in the effort to get out to a Taco Bell before noon, to be honest. But enough chit-chat. Is the Taco Bell Breakfast menu worth it? Actually yeah, I’d say so. I’m a fan of fast food breakfasts in general, with the McGriddles being my favorite, and it’s pretty standard, in terms of ingredients and quality. The AM Crunchwrap comes with choice of meat between steak, sausage and bacon, and I went with sausage, the most breakfasty of the bunch. It was all surprisingly competent, with the eggs, hash brown and sausage being pretty tasty and the right consistency. It also had a tangy sauce, which may have been the normal Crunchwrap sauce (I’m not overly familiar with the Crunchwrap) but reminded me of their quesadilla sauce. All in all, it was satisfying, and easier to eat than I remember Crunchwraps as being. The little lumps on the left are Cinnabon Delights. They’re kind of beyond this blog’s purview, but they’re delicious little doughnut holes filled with icing and served warm. They might be the best part. And now, for the main event. The Waffle Taco. Unfortunately for this blog, the Waffle Taco is both not as bad I might have feared, nor as good as I might have hoped. The waffle itself is alright, but much more akin to a thick flatbread than an actual waffle. It’s soft and a bit soggy, where I was hoping for a texture if not quite as still as a hard shell, then at least a little crispy. The sausage and eggs are fine, and the addition of syrup is a nice touch. This all probably sounds like damning with faint praise, but it’s really not a bad breakfast. It can be a little messy, so I’d probably go with the Crunchwrap in general over the Waffle Taco, but the WT is worth trying at least once. 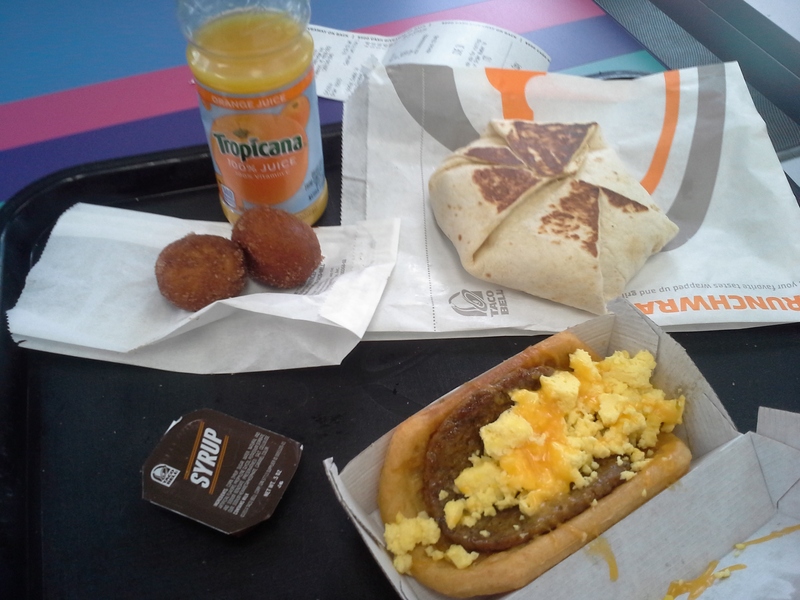 It’s odd to say I was disappointed by the Taco Bell Breakfast, because it’s actually much better than I expected. Everything about it was tasty enough, and competently executed. It’s just that McDonald’s and Burger King have had the breakfast game locked up for years now, and without something truly revolutionary, Taco Bell can’t compete. But there’s nothing wrong with being acceptable, so if you’re looking for cheap breakfast (around $5 per meal) and a Taco Bell is nearby, give it a shot.